My favorite kitchens have always been white. Which is funny because my own home does not have a white kitchen. We remodeled (rebuilt, really) our 1930 home in 1998 when cherry cabinets were very popular, and decided on inset cherry cabinetry in a shaker style. Well, that look came and went and I’ve been wanting to paint them white for a while now. Seems a shame because the wood is still perfect and so beautiful, and the feel is warm and welcoming. But my kitchen has an overall “reddish-orangey” look I no longer want. 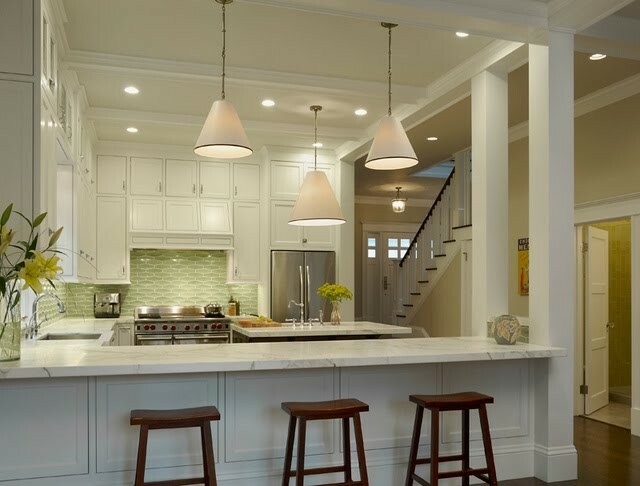 With my staging and redesign business, I regularly suggest painting dated wood cabinetry white. People love white kitchens…it’s great for resale. It makes a kitchen feel larger, more open, clean and fresh. All things buyers like in a home. Whether your taste is traditional, contemporary, urban or rustic, white works with all design styles. I also love the design flexibility it gives: you can change the look dramatically just by painting the walls a different color or changing out hardware & accessories. 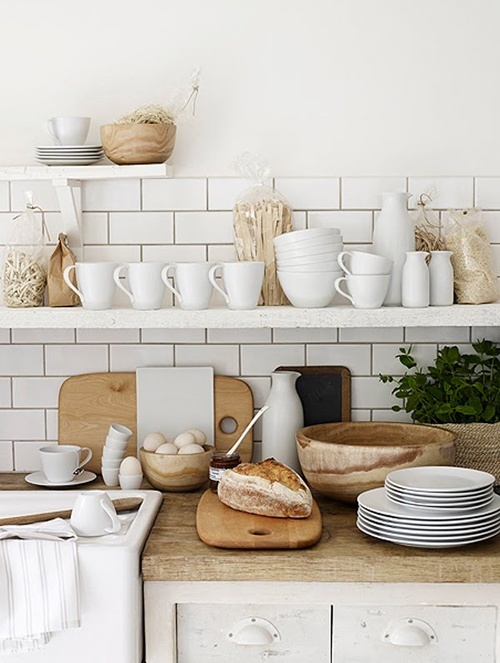 But, too much white on white can make your kitchen feel cold and unwelcoming. Kitchens with white walls, cabinets, and appliances just look sterile to me. I think the most successful white kitchens also include natural wood and organic touches in some way. It can be done by combining a wood floor, a jute rug, and wooden bowls, for example. The white creates a neutral backdrop, but it needs some contrast to give the eyes a place to rest. Wood accents look rich against the white, accent colors pop more, and even a beautiful light fixture can become a focal piece. Also important is which shade of white you choose…if you want a warm feel to your kitchen, go with a creamy white, not one mixed with grey or blue. Same goes with the lighting. White kitchens can have plenty of style and warmth, and they are classic and timeless. Can’t wait to get mine.